Indian cuisine is a vast and varied one. It is reflective of the myriad cultures and traditions that make up this vibrant country of ours. Every region has its own way of cooking and serving food, as well as customs and practices concerning food. The food of each region is greatly influenced by not just the local availability of vegetables, fruits, herbs and spices, but also by the historical and cultural background of that community. Indians are so fond of the traditional food that they take along the knowledge and practices even when they go abroad. With the advent of cookbooks and online portals, recipes do get passed on from region to region, but still, you can find distinct differences in the way the food tastes, because of the availability of ingredients and common cooking practices in each region. Pav Bhaji made in South India, for example, is quite different from how it tastes in the North; and likewise, Idli and Sada Dosa made by North Indians might be quite different from how the South Indians make it! 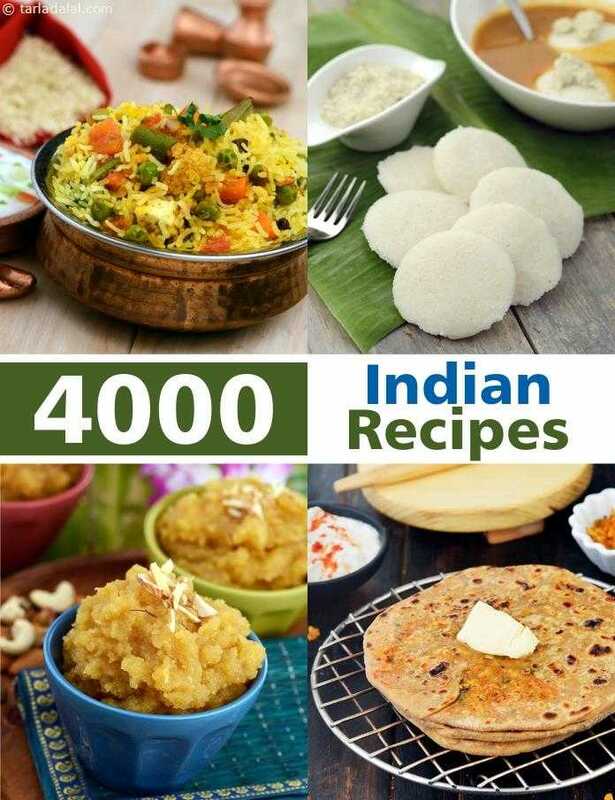 Indian Veg recipes are categorized mainly based on the region – Punjabi, Gujarati, Rajasthani, Maharashtrian, South Indian, Bengali, Hyderabadi, Mughlai and so on. Depending on the region, the main course might focus on Roti or rice, with accompaniments like Subzis, Dal, Sambhar, etc. Bajra Roti and Green Pea Pulao together with Pyazwali Bhindi and Dum Aloo could make an interesting meal, just as Cabbage Poriyal, Sambhar, Rasam and Rice would too. The cuisine of North India includes not only Punjabi food but also, Amritsari, Kashmiri cuisine. Each state has something different to offer. While Punjabi’s use lot of ghee and dairy products, Kashmiri cuisine is majorly non-vegetarian with use of saffron and other spices. People from Punjab, Amritsar and Delhi believe in having heavy breakfast of parathas smeared with white butter along with a tall glass of sweet lassi and accompaniments like fresh curd and mango pickle, Chole Bhature or Chole Kulcha. They also indulge in delectable street food like Momos, Samosa, Aloo Tikki chaat, Ram laddoo, Golgappe. Apart from that Tandoor is an essential cooking method in North Indian Cuisine. From tongue-tickling appetizers like Paneer Tikka & Mushroom and capsicum tikka to flatbreads ranging from Tandoori Naan, Roti and Kulcha, they love everything baked and grilled in clay pot ovens. Rich gravies, spicy vegetable, sizzling appetizers, delectable desserts sum up North Indian food! Descending from the Mughal empire, Mughlai cuisine is known for heavy use of aromatic and rich ingredients resulting in spicy, fragrant, lip-smacking delights. It has been one of the much admired and popular cuisines among food lovers across India. The preparation of Mughlai food is time-tested and involves slow cooking and vast preparation. Dishes like kebabs, kofta, pulao, sabzis and biryani typically include Mughlai blend and flavours. Some of the popular dishes are Mughlai Vegetable Biryani, Shahi Pulao, Baingan Musasalam, Nawabi Curry, Mughlai Makhani Paneer, Mughlai Roti. When you come to Western India, you will come across Gujarati cuisine which is an amalgam of flavor. They are mostly vegetarian and use many native vegetables and an array of spices to season them. Dals and shaak (subzis) have a sweet flavor because of the addition of jaggery. The farsaans (snacks) and mishthans (dessert) are much-loved aspects of Gujarati cuisine. The Gujarati thali is a grand feast consisting of dal, bhaat, rotli, shaak, farsaan and mishtan with accompaniments like kachumber, athanu and papad. Curd and buttermilk are a quintessential part of their meals. Rajasthan being dearth of water uses curd and buttermilk widely in cooking and vegetables being limited in supply, they eat lots of pulses and dal. It is known for its endless varieties of Kachori. Pyaaz ki kachori, Shahi raj kachori, Khasta kachori are some popular local breakfast dish in Rajasthan and sold at most 'namkeen' shops. Maharashtrian cuisine is a zingy and spicy one, which makes abundant use of aromatic and flavourful ingredients like peanuts, sesame seeds , chillies, kokum, cashew nuts , coconut, and so on. Mumbai , the city of dreams has some out of the box street food delights to offer like Schezuan Chopsuey Dosa, Mysore masala dosa, Tawa Pizza, Toasted Samosa sandwich and how can you forget the famous Vada Pav, Misal Pav, Bhajji Pav ! Going down South, people are very fond of rice which is also their staple food. South Indian cuisine relies on extensive use of traditional spices like mustard seeds, curry leaves, red chillies, broken urad dal and chana dal that impart flavor when added as a tempering to the food . Breakfast delights like Idli, Dosa and uttapams are much loved all over India. Kadubu, Benne dosa, Neer dosa, Bisi bele bhath are some classic Karnataka dishes. Mangalorean cuisine is different from Udupi, which is different from Mysore, and a food connoisseur can easily tell the difference! So, every corner of Karnataka has a culinary anecdote to tell with distinct flavours, native ingredients and exclusive cooking techniques. There is a lot of similarity between the food cooked in Kerala, and that of coastal Tamil Nadu. Tamil cuisine is a balance of spices and dals along with a combination of different masalas. Kitchen shelves are stocked with sambhar powder, milagai podi , rasam powder and popular tempering ingredients like coriander seeds, red chillies, chana dal, ginger, green chillies, garlic and curry leaves. Coconut is abundantly found in Kerala and hence widely used in food preparation. Even curries make use of coconut milk instead of water. Native fruits and vegetables like jackfruit, yam, raw banana, yellow banana, ash gourd and pumpkin are used to cook an array of dishes. The region spanning Andhra Pradesh and Telangana have their own cooking style which is a spicy one. Unlike other cuisines where pickle is merely an accompaniment, here it is the best part of the meal! Pesarattu dosa or Moong dal dosa is a classic dish from the Andhra cuisine. Gongura leaf is a quintessential Telugu ingredient, used to make delicious pachadis and peppy rice preparations. What comes to your mind when you think of Hyderabadi food? Biryani ! Hyderabadi food has much more to offer than the famous Biryani with Mirch Ka Salan. It is highly influenced by Mughlai, Persian and Arabic cuisine. Rich and flavorful sabzi, desserts loaded with dry fruits, delectable side dishes and unique flatbreads. Haleem, Double ka Meetha, Bidari Paratha, Osmania biscuit, Hyderabadi Tutti Fruti biscuit and endless varieties of Biryani are some famous food from the city. Bengali sweets like Sandesh, chum chum, rasgulla are popular not only in India but also, around the globe. Bengalis love fish and all things fish but, when it comes to vegetarian food they are big fans of chaat like Puchka, Jhalmuri, Ghugni, Doi Bora, Batata Puri. Also, Kolkata is known for street food like kathi roll, egg rolls, momos, Chowmein. They make extensive use of Panch phoran masala in their cooking. It is a spice blend made using fennel seed, mustard seeds, nigella seeds, fenugreek seeds and cumin seeds. recipes like ladoos, halwas, rabdis, jamuns, malai sweets, etc. The deeper one ventures into Indian cuisine, the more they can appreciate the diversity and limitless variety it offers. We hope you enjoy our collection of Indian Veg recipes. It may have originated from the royal kitchens, but this one’s a delight to make in the kitchen as well as relish. Toovar and chana dals are pressure cooked with lauki, tomatoes and turmeric and mixed well, before a tadka of garlic, ginger and jeera is added to it. Delicious! Tasty and healthy pancakes are the best way to start a day. . . . A delightful surprise for both kids and adults! to make things better, the addition of apples charges up the fibre content! Dum aloo is one vegetable which is loved by one and all, it is rich, creamy and spicy all in one. . . Serve it hot with Chapatis or Cooked Rice to make a homely and satisfying meal.